Wet scrubbers are used in utilities, paper mills, and chemical plants to remove sulfur dioxide (SO2) and other pollutants from gas streams. Undesirable pollutants are removed by contacting the gases with an aqueous solution or slurry containing a sorbent. The most common sorbents are lime, Ca(OH)2, and limestone, CaCO3. 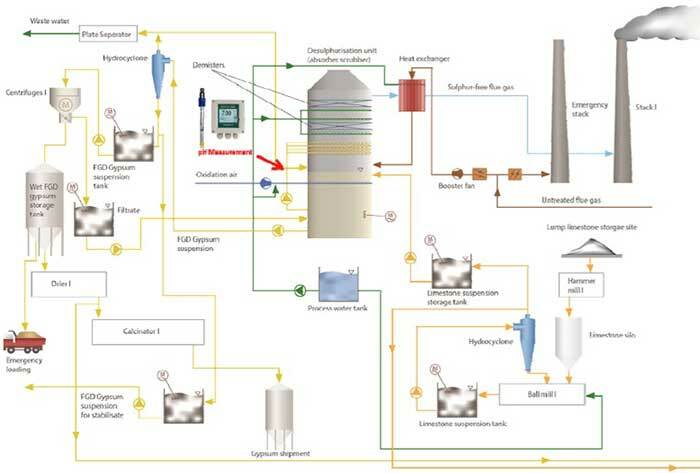 In limestone-gypsum flue gas desulfurization systems, the consumption of a desulfurization agent (lime) is controlled using online pH analyzers. Limestone-gypsum flue gas desulfurization consists of two processes: absorption and oxidation. After fly ash removal, the flue gas is bubbled through the scrubber, and the slurry is added from above. The lime or limestone reacts with the SO2 in the flue gas to create insoluble calcium sulfite (CaSO3) as shown in the equations below. A pH sensor in a recirculating tank is used to control feed of the solid lime or limestone. Neither lime nor limestone dissolves well in water and therefore, both are pumped in slurry form to the scrubber tower. In this process, it is important to promote the reaction of calcium (Ca) and to achieve a target desulfurization rate. The absorption rate is affected by the pH, concentration, temperature of liquid, and the liquid/gas ratio. When the pH of the absorbing solution is below 5, calcium hydrogen sulfite (Ca(HSO3)2) is generated. Ca(HSO3)2 is converted into sulfur dioxide (SO2) in a reversible reaction, thereby reducing the desulfurization rate. When the pH of the absorbing solution is 7 or higher, carbon dioxide (CO2) in the flue gas reacts with calcium (Ca) to produce calcium carbonate (CaCO3). This increases lime consumption. Since the pH has an influence on the subsequent oxidation process, the pH of the absorbing solution should be kept between 5 and 6. The calcium sulfite may be further reacted with oxygen by oxidation to produce gypsum. This is done normally under a pressure of approximately 500 kPa and a temperature of 50 to 80 °C. The pH of the absorbing solution in the absorber is approximately 6, and normally maintained at around 4. The calcium compounds produced in scrubbers tend to accumulate in the recirculation loops and can cause a buildup of scale. Scale on the spray nozzles affects the atomization of the water droplets and reduces the scrubbing efficiency. The lime can cause scaling on the pH electrode which affect the pH measurement. To ensure accurate measurements, frequent cleaning of the electrodes with acid is required, which adds to both maintenance workload and cost. So having an accurate reliable pH control is necessary not only to control the lime and limestone feed, but also to forestall the start of scaling, as it is much easier to prevent scaling than to remove it. One solution in the past was to install and auto cleaning installation that would save on maintenance time and expense, to help extended the life of the probe. However since the cation reference sensor, SC24V, was released in 2010 end users have changed out either existing Yokogawa product or competitors product and replaced it with the revolutionary differential pH/ORP sensor. Since the cation sensor, SC24V, has NO junction, there is NO path from the process to the internal element; so NO poisoning can occur. Since there is NO junction, there is NO plugging or coating problems to worry about and there is NO electrolyte depletion problem, because there is NO electrolyte. The sensor virtually eliminates problems caused by aging and pollution of the liquid junction. Customers will have less maintenance time and longer sensor life. The FU24F is a digital SMART pH/ORP sensor made with a chemical resistant PPS 40GF body for harsh pH applications. The SENCOM™ PC Software, SPS24, offers a unique means to optimize the performance of pH/ORP sensors for enhanced reliability and process safety. 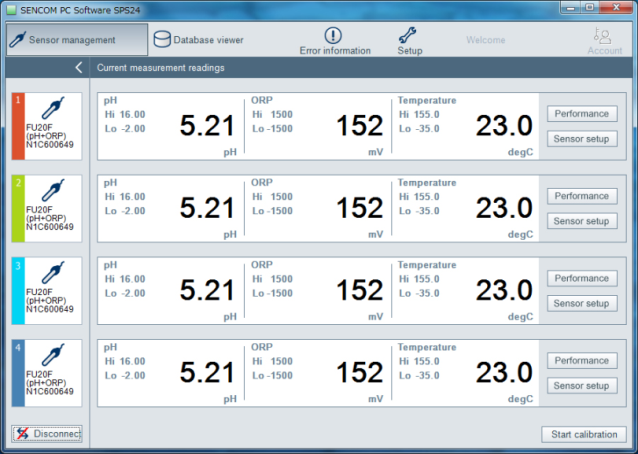 The software allows the operator to monitor pH/ORP sensor performance, calibrate and configure various parameters.